The District 7450 Committee on Service Projects and Fundraisers exists to serve Rotary clubs in their continuing mission of “service above self” by providing tangible results through the catalogues on service and fundraising ideas. There are 3 catalogues: Service Projects, Fundraisers, and Project Partners. There is also a report to help Rotarians learn about, connect and consult with one another. The Service Project Catalogue provides Rotarians with ideas for service projects, as well as a look at which Rotary clubs are doing those projects. For example, if a club wants to upgrade a community playground, they can look in this catalogue for other clubs doing such a project and reach out to them for advice or a possible partnership. The Fundraiser Catalogue lists a variety of fundraisers from Rotary clubs in District 7450. This can provide inspiration for a new fundraiser, as well as connect clubs to others who are doing a specific type of fundraiser in order to get advice or information. The Project Partners Catalogue lists organizations with which District 7450 Rotary clubs are already partnering and working to help their communities. If a club wants to work with a certain organization, they can look it up in the catalogue to find out if any other clubs currently work with it, as well. 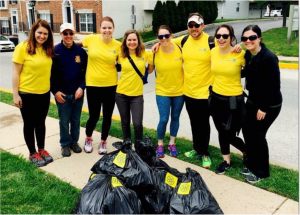 This provides opportunities for clubs working together toward a common goal to serve the community and broaden Rotary’s impact through coordination of activities, such as on Rotarians At Work Day. The Catalogues are living documents, so clubs can continue to provide information about their service projects, fundraisers, and partnerships to the committee for periodic updating and publication. Email your information updates to the District Committee on Service Projects, Fundraisers, and Project Partners.